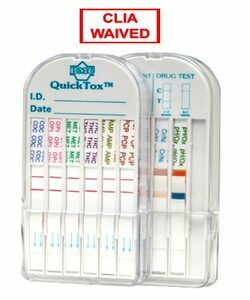 QuickTox® is a multiple drugs of abuse dip card that allows for an easy mix and match of tests. It is capable of testing up to 13 drugs or 11 drugs and 6 adulterants simultaneously. With its flat design and clear cap, QuickTox® can be photographed without fear of contamination of the tester's desk or bench.